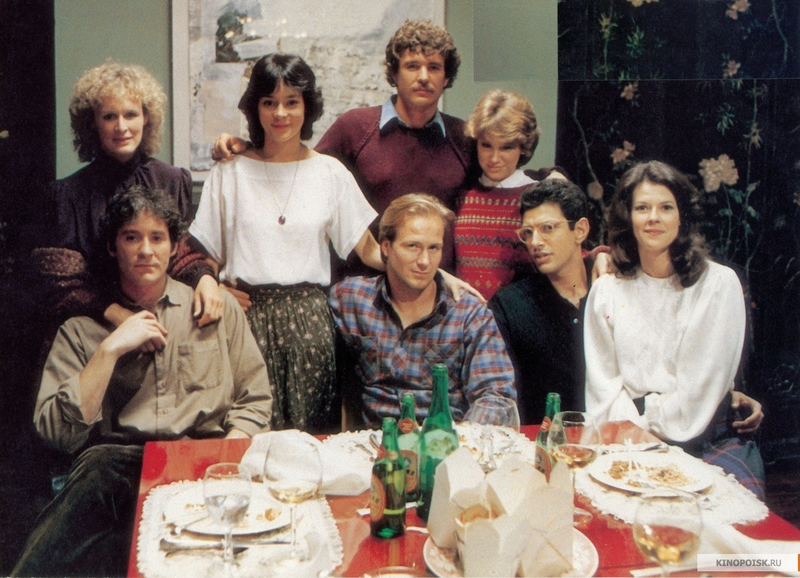 It’s bizarre and more than a little morose when I think about the fact that I am older than the central characters in Lawrence Kasdan’s classic coming-to-terms-with-things epic, The Big Chill. All in their mid-thirties, more than a few of them established and respected pillars of their respective communities (except rebel-boy Nick), they reunite for the weekend in South Carolina after the suicide of their friend, Alex (Kevin Costner, not appearing in this film). Kasdan made a name for himself, penning screenplays like The Empire Strikes Back and Raiders of the Lost Ark. His first film as director was the brilliant film-noir spoof, Body Heat starring William Hurt and Kathleen Turner. 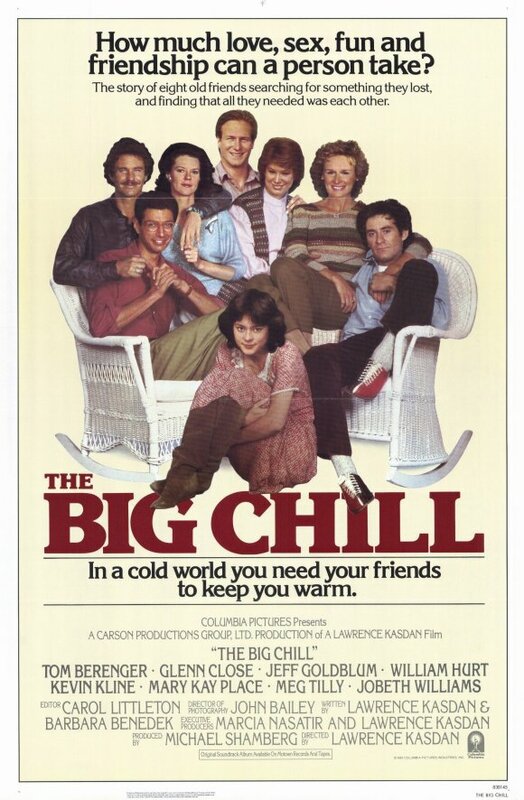 The Big Chill is a movie that resonates with a different age group – that of our parents, the “Baby-Boomers”, children of the war and the “Greatest Generation”; those who turned their backs on what they perceived was a mindless emphasis on patriotism, imperialism, and consumerism (lots of -isms). As they grew into adulthood, they chose an uncomplicated path to self-destruction through drugs and the concept of free-love because they saw those same failings in themselves. A good portion of The Big Chill fixates on this idea. This is where my conflict comes in. I’m the product of a lost generation: the children of the “boomers” who don’t relate to these internalized conflicts, because we’ve nurtured apathy and despair and saw the hypocrisy in our parents long before they did. I’m sorry, this is getting preachy. The cast of this movie is exceptional. Kevin Kline is Harold, a successful businessman. Glenn Close is his long-suffering wife, Sarah (who once had an affair with Alex). Handsome Tom Berenger is Sam, a television star. JoBeth Williams is bored housewife, Karen. William Hurt is the aforementioned rebel-boy, Nick. Jeff Goldblum is Michael, a writer for People magazine (who once published a hatchet-job on Sam), obviously a stand-in for Kasdan. Mary Kay Place is a successful attorney, unlucky in love. Meg Tilly is Alex’s much-younger girlfriend, Chloe. Shot in a real house in Beaufort, the cast lived together for several weeks before shooting commenced, which explains their unbelievably easy chemistry and mutual affection. Kline and Hurt’s characters are disillusioned in their adulthood. Berenger is clingy after his recent divorce. Goldblum is looking to scam his friends out of money so he can open a nightclub. Mary Kay Place wants to have a baby. JoBeth secretly loves Berenger and wants out of her dead-end marriage to boring, dependable Richard. Glenn Close is the emotional center of the group, weeping for Alex. Meg Tilly’s Chloe is the innocent; blissfully ignorant of the group’s woe. Because these characters tend to run together with their fears and motivations, Chloe is the one truly unique person under this roof. She is sensitive and idealistic, but also lazy and giggly. Chloe is a part of her own lost generation, not quite old enough and not quite young enough. It’s only logical she connects the most with Hurt’s disaffected Nick, because he seems to be closest analog to the mysterious Alex. Alex is another matter entirely. Completely missing (even in spirit) from the film, he appears to be the glue that held this little community together, and without his gentle sway, everything falls apart. It’s interesting in that I was eleven years old watching this movie (this is a movie explicitly not made for me) for the first time with my mother, who laughed at every joke, and cried at every somber moment, instantly identifying with these characters. The reason I enjoyed the movie had more to do with the very witty dialogue and what’s more, I appreciated the friendships, the connections, and the warmth of the performances. When I watch the movie now, I still think I’m a kid and couldn’t possibly understand the dilemmas of The Big Chill even though I’m much older than I’m younger than that now.